Millions of people around the globe got their hands on Apple's new iPhone 6 and 6 Plus yesterday. 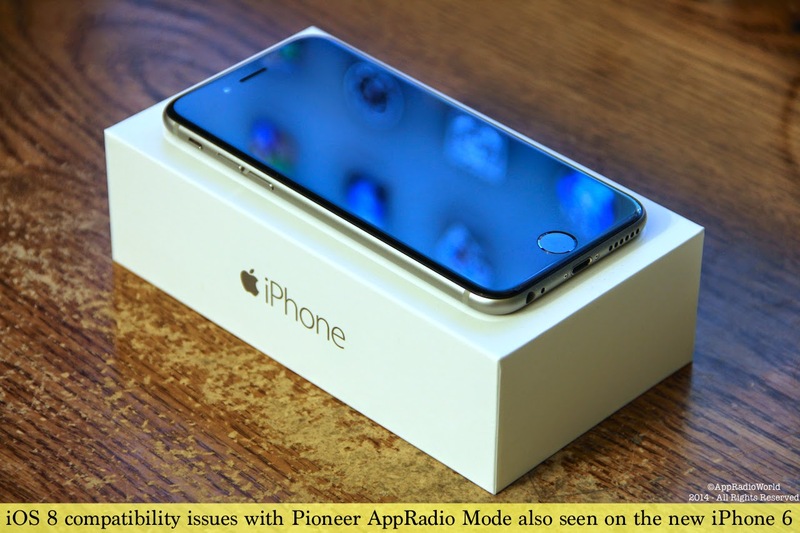 We tested out the iPhone 6 with a Pioneer AppRadio 3 (SPH-DA210) for issues while using AppRadio Mode. The current issues we mentioned in our post regarding iOS 8 continue to exist. NEW: One of the app developers informed us that the issue is due to a bug in Pioneer's library which has a problem with the new iOS 8 keyboard system. If any other app developers are reading this, please confirm in the comments below. Hopefully a fix for these issues is coming soon, especially the screen resizing issue. Have you tried making bluetooth phone call? The phone will connect and I can place a call through the screen of the 8000, but once the call connects, the 8000 goes back to playing music as if the call ended. Also having the same problem making a phone call via bluetooth. I can play bluetooth audio fine, but cannot use the phone, access address book, etc. Sent a note to Pioneer but, no surprisingly, haven't heard anything back. Same iPhone 5s I think it might be related to IOS 8 worked fine before update. Now calls are unstable. I found a work around to the Waze keyboard. Instead of disconnecting the phone from your radio, simply just use the iPhone's map and enter the address. Once you enter the address, there is a button that says APPS. Press APPs and you should see Waze. Hit route and you will have the address. I know it is a pain, but it works for now. I've had my AppRadio working with my iPhone4 a little over a year. Made the move to iPhone6 and of course the cable doesn't work. Sounds like its worse than that with it not working with new IOS. So do I pick up an older iPhone and hack it somehow to keep it working? I don't even know the part number for the cable needed if I wanted to try the iPhone 6 can't seem to find it on Amazon. Maybe its time to sell the AppRadio and move on. I have a strong feeling that they are not working on updating to IOS 8, instead, ask us to buy newer decks that have car play. This is one of marketing to buy new stuff. Its already december and no update bugs me..........Do anyone here know of any news on whether they are working towards it??? They are not updating this as I have called them and they quite frankly said if you wanted to work by a new deck. In fact further detail I've had issues with my android connecting to either appradio live and mirror link as well as having problems with iPhone connecting to appradio and the car play. I had the car play crash so hard my car that I actually had to shut the engine off to get the radio to reset. There was no way around it. I'm not happy with the way pioneer is doing business anymore. They used to be a great company now they get you suckered into something like this then they don't want to fix what they advertise. I think what needs to happen is a bunch of us need to get together and form a class action lawsuit and sue them. People like me who are unlimited funds but the radio for maximum capacity and maximum compatibility for everything and ended up with only being able to have my kids watch movies in the back of the truck. Other than that nothing else works. Besides Pandora the cameras for backup and forward and iHeartRadio. I forgot to mention that I have the Pioneer AVIC 5100 neX..